All scientific Hamari publications published in 2017 added! CPhI Worldwide 2017 – Thank you! CPhI Worldwide 2017 was a great success for us! Thank you for meeting us and we hope to see you next year in Madrid! Hamari Newsletter 2017’s Issue 2 Released! Check out our NEW Glycylglycine Leaflet! Hamari’s Equipment List just got updated! Out with the old, in with the new! Hamari’s original Newsletter on the latest trend in chemical research is listed in the following link. Book an appointment to talk with us or just drop by. Let’s see how we can help you out! SEE YOU AT in-PHARMA Japan 2017! Hamari Japan will be patiently waiting for you at our booth. Let’s talk about what active ingredients you need synthesized! COME SEE US AT THE AMERICAN PEPTIDE SYMPOSIUM 2017! Let us teach you our new advances in unnatural amino acid synthesis. MEET HAMARI AT BIO INTERNATIONAL CONVENTION 2017 IN SANDIEGO! JETRO (Japan External Trade Organization) has kindly subsidized Hamari’s attendance at BIO International Convention in San Diego. By all means, drop by JETRO’s booth (1911) to meet us and see what we can offer you in terms of chemical synthesis and large scale manufacture of active ingredients! 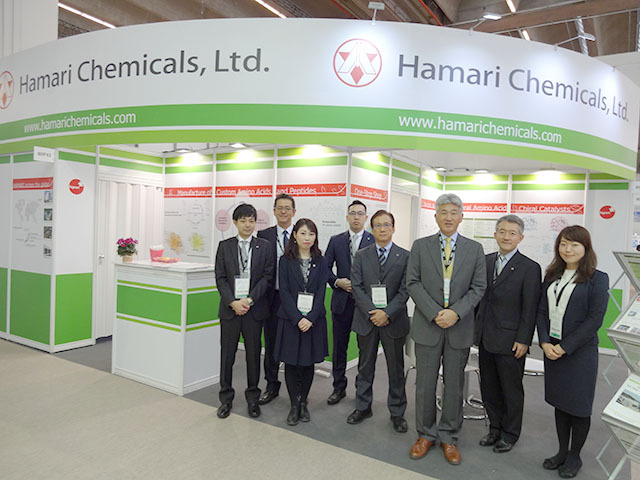 President and CEO of Hamari Chemicals, Ltd.
We added a webpage describing our list of publications. Check it out, now!